Gardening in Spain Fig Trees. 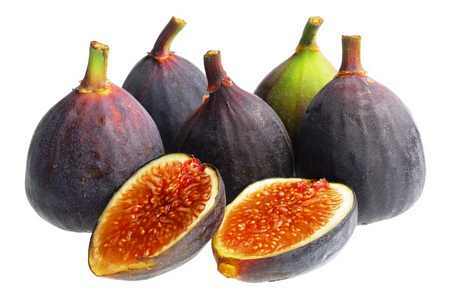 Two crops of figs are potentially produced each year. The first, called the breba crop, develops in the spring on last year’s growth. 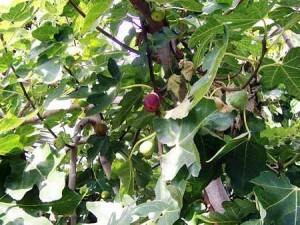 In contrast, the main fig crop develops on the new growth and ripens in the late summer or fall. 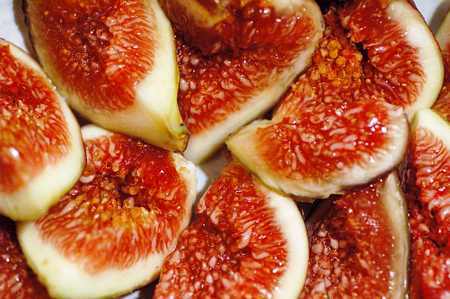 Known as ‘The tree of life’ by the ancient Egyptians and much enjoyed by Cleopatra and Ulysses, the fig is a wonderful and delicious species. Remnants of figs have been found in excavations of sites traced to at least 5,000 B.C. making the edible fig one of the first plants that was cultivated by humans. If planting more than one tree allow 6 to 7m between trees. The common fig (Ficus carica) is a large, deciduous shrub or small tree native to southwest Asia and the Mediterranean region. Figs are ideal in tubs or pots as bushes or half standards. 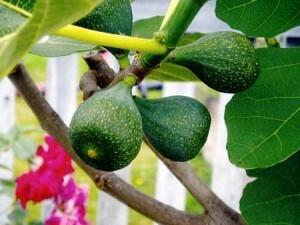 When grown for their architectural impact in the garden however, figs are not fruit trees for small places. The roots are greedy, traveling far beyond the tree canopy. The spreading root system is quite shallow and competitive, giving nearby plants a fairly hard time (and is adept at cracking its way into underground sewer pipe systems). Although commonly referred to as a fruit, the fig fruit is actually the flower of the tree, known as an inflorescence (an arrangement of multiple flowers), a false fruit or multiple fruit, in which the flowers and seeds grow together to form a single mass. The fruit varies in colour from yellowish-green to coppery, bronze, or dark-purple depending on the cultivar. 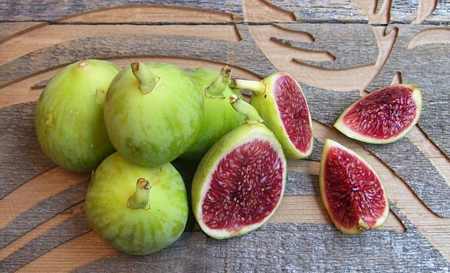 Two crops of figs are potentially produced each year. The first, called the breba crop, develops in the spring on last year’s growth. 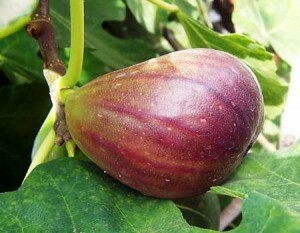 In contrast, the main fig crop develops on the new growth and ripens in the late summer or fall. The main crop is generally superior in both quantity and quality than the breba crop. In the case of the common fig the flowers are all female and need no pollination. There are 3 other types, the Caprifig which has male and female flowers requiring visits by a tiny wasp (Blastophaga grossorum), the Smyrna fig, needing cross-pollination by Caprifigs in order to develop normally, and the San Pedro fig which is intermediate, its first crop independent like the common fig and its second crop dependent on pollination. Caprifigs are not edible. 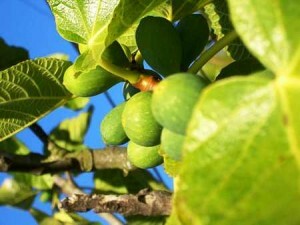 Water: Because of its well-developed root system, the fig tree can stand very dry conditions. However, it likes more humid situations – especially in spring and the beginning of summer. Mulch the soil around the trees to conserve moisture. Young fig trees should be watered regularly until fully established. If a tree is not getting enough water, the leaves will turn yellow and drop. Also, drought-stressed trees will not produce fruit and are more susceptible to nematode damage. Plentiful sunlight is the key to a good fruit crop. Early morning sun is especially important as it will dry dew from plants therefore reducing the incidence of disease. Soil: Fig trees are not too particular and can grow in just about any type of soil, but they grow best in loose, fertile, slightly sandy soil. They are tolerant of alkaline soils of many textures, but will not put up with wet feet or very acid soils (under pH 6). The trees are also fairly tolerant of moderate salinity. Good drainage is the most important consideration. Areas of poor drainage restrict oxygen to the roots resulting in the stunting and often the eventual death of the tree. Fertilizer: Regular fertilizing of figs is usually necessary for potted trees and in most home garden soils to maintain good tree vigour and high production. The fig trees mostly require potassium and do not need much nitrogen fertilizer, which tends to cause over-development of the vegetation and under-development of the fruit. Toxicity: The latex of the unripe fruits and of any part of the tree may be severely irritating to the skin if not removed promptly. When harvesting use gloves and long sleeves to prevent skin irritation. 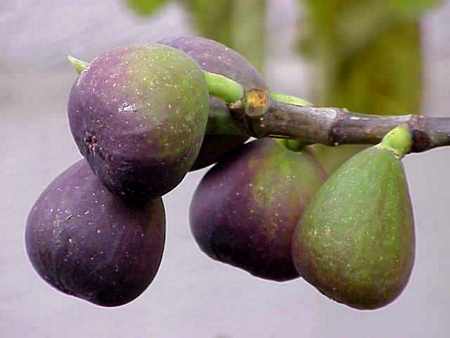 Figs are ripe when the stalk bends and the fruit hang down. The ‘eye’ at the bottom will open and a drop of sugar appears. Try to beat the birds! A net helps, and should be put on well in advance of ripening. Blackbirds are the gourmet fruit eaters of the feathered world. The skin of the fig is thin and tender so harvest the fruit gently to avoid bruising. Fresh figs do not keep well and can be stored in the refrigerator for only 2-3 days. Drying is an efficient way of storing these very perishable fruits. They take 4-5 days to dry in the sun and 10-12 hours in a dehydrator. 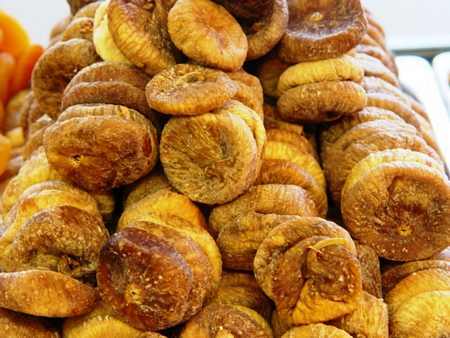 Dried figs can be stored for six to eight months. Fig trees are productive with or without heavy pruning which is essential only during the initial years to form the trees. After that annual pruning for form is generally all that is required. The fig tree grows naturally like a bush. This keeps the branches of the tree low, allowing easy gathering of fruit. With appropriate pruning one can give the tree a goblet shape with a single trunk. To do this one must regularly eliminate the sprouts from the base. While the one-crop fig tree varieties can be severely pruned on all the branches, one must be more careful with the two-crop fig trees – every removed branch bears brebas! Pests and diseases: Unlike most fruit trees, the fig tree is very robust and does not require much treatment, if any. Its main enemies are moths, canker, and flies. A fresh fig is one of the best fruits of the Mediterranean. They can be eaten fresh, dried, roasted, stewed, preserved, added to salads or soaked in liqueur and served over ice cream. In “A Platter of Figs and Other Recipes”, David Tanis shows readers how to slow down, pay attention, and give ingredients their due. Worlds away from showy “Food Network” personalities and chefs who preach fussy techniques, Tanis serves up charming, unassuming meals for friends and family: couscous with rabbit and turnip for a special birthday fete, clam and chorizo paella to eat by the fireplace, and turkey with duck confit for Thanksgiving. Fig growing in Spain Figs are ideal in tubs or pots as bushes or half standards. It is called Hints and tips about gardening in Spain. The pitfalls and the joys. Limited advertising is allowed provided it is on subject.